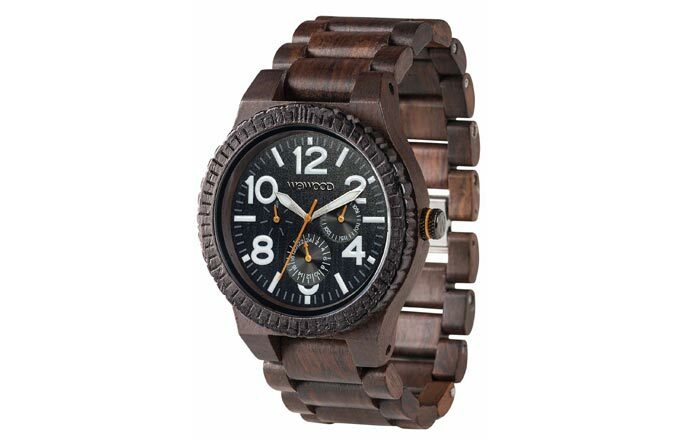 The wood watches have become very popular in the last several years, and their popularity continues to grow. Why do the people would prefer wearing a wooden watch instead of a standard one, made of metal or plastic? There are many good reasons for that. Unlike the majority of classic wrist watches, every wooden watch is entirely handmade. When working with wood, it is impossible to make any two pieces look the same. Every two watches, even if they are a part of the same production line, will be crafted from different part of the wood, and each two parts will of the wood would have a different pattern and some variation in grain and color. So buying a wood watch you can be sure that there’s no other watch like yours. The wood is probably the most eco-friendly material. By its very nature, it is biodegradable, and the resources (water, electricity, workforce, etc.) needed to produce anything from wood are simply incomparable to ones needed to produce the same object from metal. Moreover, companies like WeWood, PlantWear, and OriginalGrain are truly committed to preserving the nature. For every watch they sell, they plant a tree. 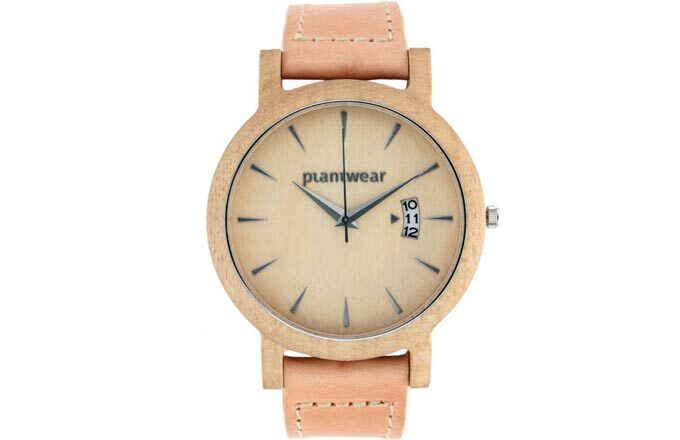 For anyone genuinely caring about the sustainability of the Earth’s ecosystem, purchasing a wooden watch is a great way to contribute to the protection of nature. 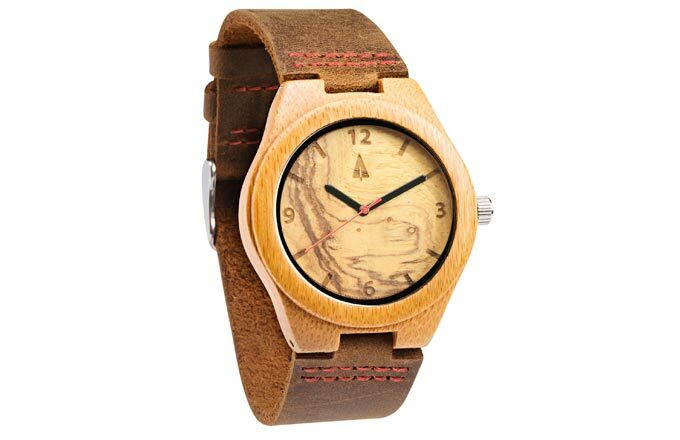 How many people do you know with a wood watch? That’s right. Not only every watch made from wood is unique – there’s simply a very few people owning a wood watch. Wearing something so unordinary is fun, not to mention the fact that, as you will soon find out, your wooden watch is a great conversation starter. Your ordinary metal, plastic or ceramic watch will wear down over time, and you can do nothing to avoid that. But your wooden watch will only look better with the passing of time. Even the most expensive wood watches are really affordable. Actually, it is quite difficult to find a wooden watch that costs more than $500, and most of the models are priced in $100 to $200 range. But perhaps the biggest advantage of the wooden watches over the classic ones lies in one very simple thing which, like all other things of real importance, can not be measured. Your wooden watch will give you a feel of warmth and coziness, which is so typical for the living wood and which can not be matched by any of the metal or plastic wrist watches, no matter how beautiful and charming they may look. Are wooden watches actually made of wood? Wooden watches are not entirely made of wood. For obvious reasons, their movements are standard mechanical and (more often) quartz movements. Some other small parts, such as hands, crowns, and clasps are also made of metal. 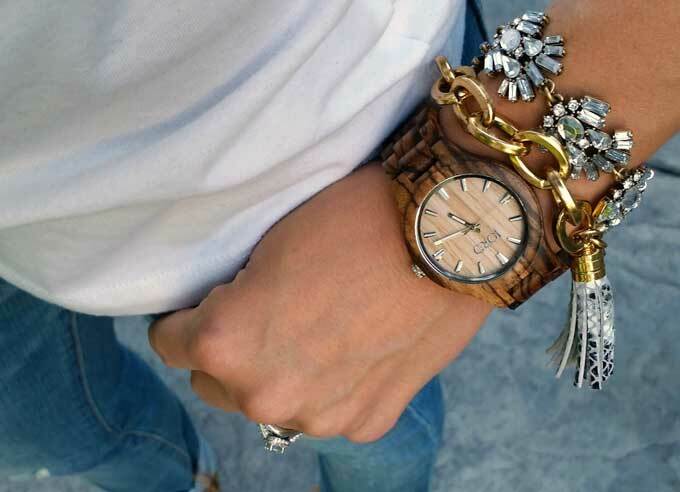 Many models feature leather straps, and sometimes bracelets are made of mixed wooden and metal links. Most wooden watches, however, feature cases, dials, and bracelets made of wood. Fun fact: Actually, there are watches which feature a wooden movement – like some models created by the Ukrainian watchmaker Valerii Danyevich – but they are very rare and should be considered more as an exotic piece of artwork rather than as an actual timepiece. Nobody and nothing is perfect – not even James Bond. Not even wooden watches for that matter. 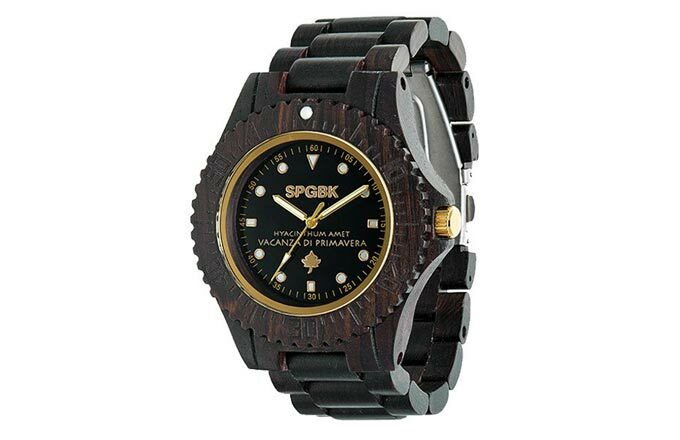 Due to the very nature of the wood, the wooden watches are prone to scratches and they afraid of water. Wood is soft and can be scratched very easily. Even a slight, accidental knock may leave a dent or scratch, so you should always pay extra care to what you do when wearing your wooden watch. Most of the wooden watches are not waterproof, or if they are, they are only resistant to occasional water splashes or light rain at best. There are very few exceptions to that rule – for example, the Oceania model made by Pacific Standard Time Co., which is water resistant at 10ATM (100 meters). But you should not let these drawbacks discourage you from buying a wooden watch. Unless you insist on wearing your wooden watch at the pool or on a hiking trip, it will be a perfect accessory for every other occasion. Many people still think that wooden watches can not be combined with outfit other than a casual shirt or jacket, but that is not true. Your wooden watch could be a perfect match to (almost) every outfit, except for, perhaps, the formal black-tie suit. The guys at TreeHut have an excellent article on the subject, which we highly recommend you to read. Another nice guide on how to wear your wooden watch can be found at SpringBreak’s blog. We have selected 12 models which, we believe, are the best ones to demonstrate the beauty of the wooden watches. 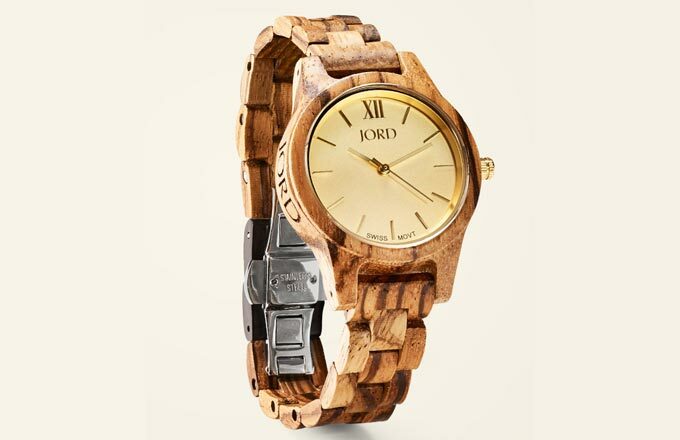 Jord’s Frankie series watches are amongst the most stylish wooden watches you can buy. This watch would be an excellent accessory for men who enjoy the casually elegant style. Frankie series watches are powered by the Swiss Made Ronda Normtech movement, which is extremely thin and lightweight. The design of the watch is clean and elegant, and champagne colored dial complements beautifully with the fine grain of the zebrawood and gold toned hands and indexes. Frankie series also offer six other color options, so not finding a single Frankie model which you will not fall in love with is quite unlikely. All Jord’s Frankie series watches feature scratch-resistant sapphire crystal and are waterproof at 3 atm. (which is, they are splash-resistant, but should not be submerged in water). 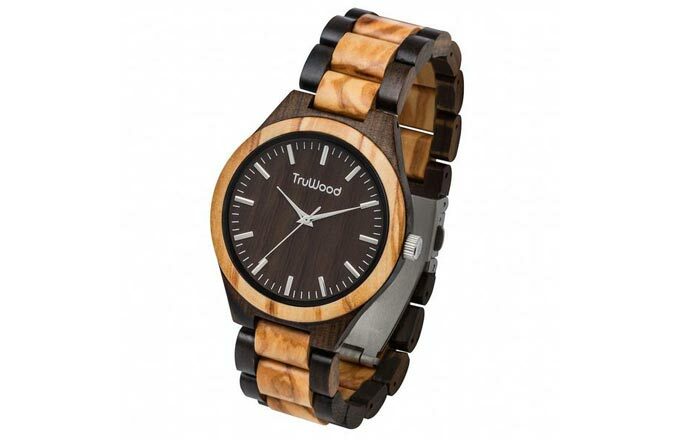 TruWood Hybrid features relatively common for a wooden watches two-colored case and bracelet, made of two different kinds of wood – in this case, zebrawood and dark sandalwood. The finish is pleasantly smooth, the links of the bracelet are well aligned and firmly joined – all this speaking of good quality. The dial is made of dark sandalwood, in a nice contrast with the silver-toned hands and indexes. The watch is powered by Japanese quartz movement and is splash-resistant. It comes in a nifty round bamboo box with engraved lid, which is another nice detail. TruWood Hybrid could be a great addition to your everyday casual attire. Its size of 40mm makes it suitable for both men and women. 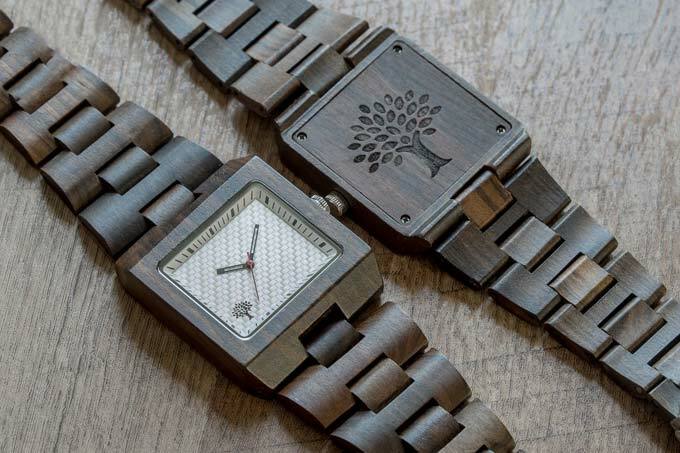 Last but not least: TruWood will plant ten trees for every order they get, so if you love wooden watches and care for nature conservancy, TruWood Hybrid will be a great choice of an everyday watch for you. Although it looks modest and simple at first glance, there’s something in The Little Bamboo that makes you want to look at it again. I believe the secret is in the perfect balance in shape, proportions, and color between its components – that’s what always makes a classic design look so appealing. That classic, minimalist design plus the some small, but very important details is what makes The Little Bamboo our favorite among all watches reviewed here. Use promo code WU500 at checkout and get The Little Bamboo at 20% off the sale price. The watch is powered by Japanese Miyota quartz movement, which is de facto a standard in wooden watches world. 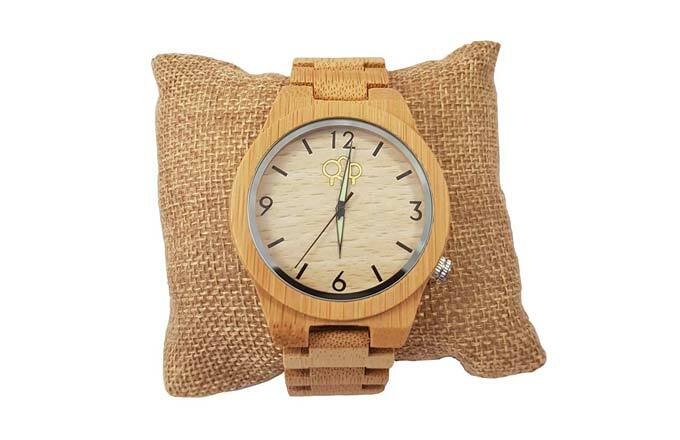 The case and the bracelet are made of bamboo, which is one of the reasons why the Little Bamboo is so lightweight – wearing it, you can quickly forget that you have a watch on your wrist. The finish of the wooden parts is smooth and precise, which speaks of good quality. The set includes a neat little canvas cushion, a tool for changing the links of the bracelet, and a wooden gift box. The hands are luminous, outlined in black, and the indexes are clear and easily readable. There are no inscriptions, engravings or applications whatsoever, except for the little gold toned company logo. By getting rid of all bells and whistles, Little Oak had created a great design which is impossible to remain unnoticed. Springbreak Midnight is not that big (for a men’s watch), but its rugged, sport-styled bezel makes it look bigger that it is. In fact, that is a part of its allure, because Midnight is made to look masculine. The case and bracelet are made of black sandalwood, and the gold toned elements (the ring around the crystal, hands, indexes, inscriptions and the crown) stand out nicely. Midnight features Japanese Miyota quartz movement and hardened mineral crystal. The bezel is just decorational, so don’t try to rotate it. And – last but not least – Springbreak offers a lifetime manufacturer’s warranty for all their watches. Springbreak Midnight comes at a very affordable price and will look great with any casual outfit. The wooden watches featuring multiple subdials are not very common, so the men who like to wear sport-style watches don’t have a big choice if they want to buy a wooden watch. Here’s where WeWood’s Kardo series watches come to rescue. The Kardo Choco White has the solid, sturdy look, typical for the ordinary men’s sports watches, combined with the irresistible charm of the wooden watches. The case and bracelet are made of Indian rosewood. The diameter of the case is 46mm, which is just the right size for men’s sports watch. The movement is quartz Miyota 6P22, featuring three subdials, displaying military time, date and day. The Kardo series can be purchased in five different versions, each made of different type of wood. 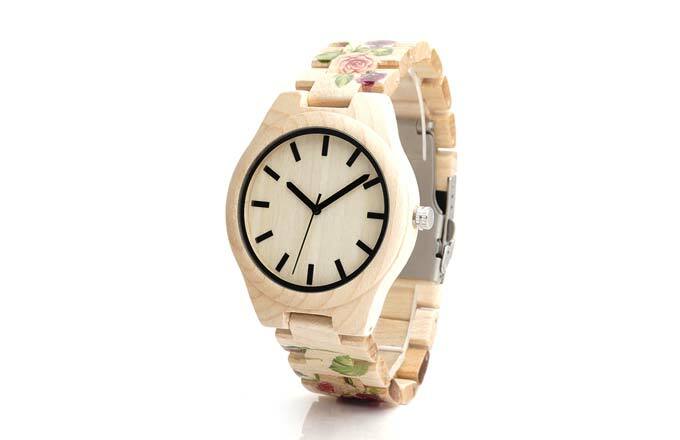 Originally this watch was not included in the list of wooden watches I wanted to review here. The Glenwood’s features are quite standard for the wooden watch, and nothing makes it stand out of the rest. But then it is not the tech specs what you look for at first place when choosing a wooden watch. So I decided that the review will not be complete without a watch which is so stylish and which so much resembles some of the best modern classic designs created by watchmakers such as Longines, Dreyfuss and Co. and Karl F. Bucherer. So here it is – The Glenwood by Lux Woods – a great choice of wooden watch, suitable to wear both in casual and official occasions, for the fans of the classic and minimalist style. Probably the first thing that comes up in your mind when you see The Rose for the first time is something like “Whoa! Now that’s beautiful!”. There are many ladies’ watches around which are both colorful and stylish, but I personally can think of just a few which look so refreshingly cool from the very first sight. The Rose’s design is not sophisticated. In fact, it is quite simple. But it is so cheerful, crisp and airy that it makes you feel happy every time you look at it. Use promo code WU500 at checkout and get The Rose at 20% off the sale price. 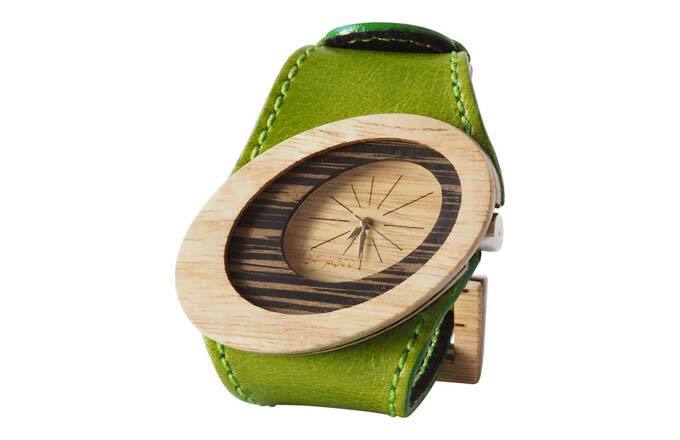 The watch is finely crafted, both case and bracelet are made of thoroughly smoothed white maple wood. The Japanese quartz movement is simple but reliable. The white maple dial is clean and easy to read, with black hands and indexes. Although The Rose is a bit bigger than usual for a women’s watch, the delicate rose flowers printed on the bracelet makes it so unmistakable feminine. And, if you are still in doubt if that is exactly the watch you want, maybe the fact that this is a limited edition which might become unavailable soon will help you make your decision towards purchasing it. On a slightly side note, those who care about nature conservancy will be glad to know that Little Oak claim they will plant ten trees for every order they receive. 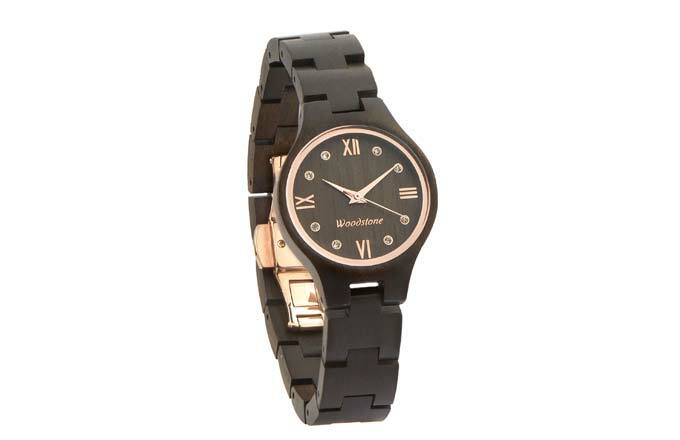 Queen is one of the few wood women’s watches that goes well with a blazer or even with an evening dress. It is powered by Swiss Ronda movement. The hands and indexes are gold plated, and the dial is decorated with eight tiny Swarovski crystals for some extra chic. The case and bracelet are made of black sandalwood. The case size is just 29mm, and the watch feels very delicate and elegant. All that makes The Queen by Woodstone a great choice for a dress watch. Woodstone’s Queen series offer a choice of five color variations and includes watches made of maple, rosewood, purpleheart wood (another great choice for a dress watch) and green sandalwood. 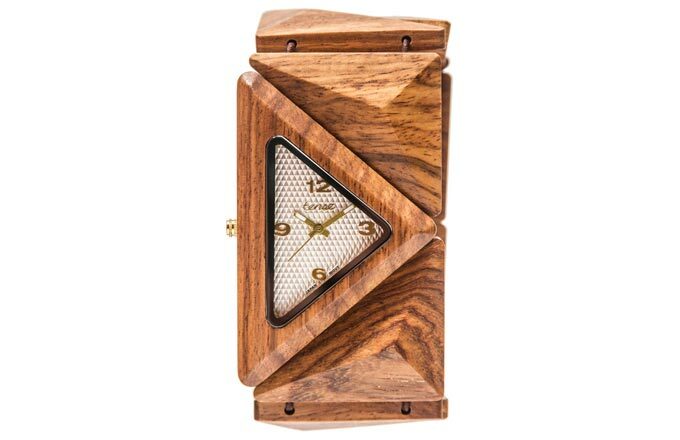 What makes this watch stand out is the unique wood grain on the dial. Now, many wood watch manufacturers decorate their watches with various motifs and patterns, and most of them look pretty cool indeed. However, none of these man-made motifs can match the amazing simplicity and natural beauty of the plain wood grain. Moreover, each watch will have its very own and truly unique grain. The case is made of bamboo. For the strap, Tree Hut use soft and comfortable genuine leather. The face is made of olive wood and is clean and easily readable, with the hour indexes and the company’s logo engraved on it. Tree Hut succeeded in creating a women’s watch which feels and looks great and which would be a great addition to your casual wardrobe. Amano Artisans’ watches are not widely known, and that’s a pity because their watches are more work of art than an everyday accessory. The Orbit collection itself includes 16 different color variations, which should be more than enough for even the most meticulous eye to make a choice. Every wooden watch is unique due to the natural grain of the wood, but Amano goes one step further. While most of the manufacturers use prints for their logos, indexes and various decorations, every Orbit watch is hand-painted. Buying one of Amano Artisans’ watches you can be absolutely sure that you own unique, one-of-a-kind, made-just-for-you piece of art. Royal Series is the flagship of Plantwear’s collection, which includes five models, available in five different colors. Maple, however, is the most elegant and feminine model in the series. Although it is slightly on the bigger side, Maple is lightweight and neat, and would be an excellent choice even for ladies with thin wrists. The pink leather strap is a perfect match to the white maple case. The dial is also made of maple. The company’s logo is not just a print – it is embossed, made of stainless steel. Such attention to detail clearly speaks about good quality. The watch resembles the classic Longines Heritage and, although made of wood, possesses the same air of relaxed elegance as the classic Swiss timepiece. Delta by Tense is unique even by wooden watches standards. First, watches with triangular-shaped face are quite uncommon. Second, Delta is more of a bracelet than just a regular watch – it has no clasp, and its band is made of pyramidal shaped blocks, joined by an elastic band. 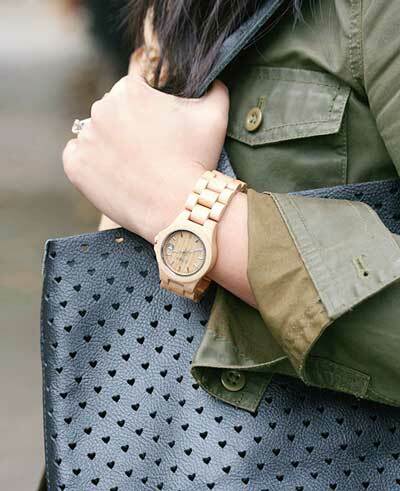 And – last but not least – that’s one really oversized watch, even compared with men’s sports watches. In other words – if you want to have a unique, extraordinary watch, then Delta is for you. Delta is available in six different colors: dark and green sandalwood, rosewood, walnut and the truly unique combination of teak, walnut and rosewood.